Are your talent pools looking a bit shallow these days? If you have positions to fill now or in the future, hosting a career fair or networking event could help you find talent and fill roles quickly. These type of events are a great way to meet a ton of candidates who want to work for you in one place at one time. Reserve the Space: Whether you plan to have it in your company headquarters or at a remote location, securing a comfortable space to hold the number of guests you are anticipating is step one. Job fairs and networking events are often held after office hours, for example around 5:00 p.m. to 9:00 p.m.
Reserve the Equipment: Depending on your location, you may need to reserve tables, chair, audiovisual equipment, computers, and tablets. By setting up mobile kiosks using a tablet and QR codes, you can quickly store and track new contacts within a system like iCIMS Connect instead of collecting a stack of resumes. Determine your Target Audience: Are you hoping to network with people in all fields for future hiring needs or do you want to focus on a specific hiring need such as sales people? Make sure you know who you want to come to your event and advertise accordingly. Find Brand Advocates: Find employees from each department you are trying to hire in to meet with prospective employees and talk about their role in the company and why they love working there. A mix of hiring managers and employees will be best to start meaningful conversations and make connections.? Promote the Event Online: At least two weeks before the event, post an advertisement on your careers page, the company’s social media pages. Write a Press Release: Write a press release about the event and send it to local newspapers. Employee Referrals: Let your employees know about the event and ask them to share it on their social networks and with anyone they think would be a good match for the company. Remind them of any employee referral programs you may have in place. Connect With Your Talent Pools: Use your candidate management system or recruitment marketing automation tool to send out email invites to the candidates in your databases. You can target specific talent pools depending on your current hiring needs. 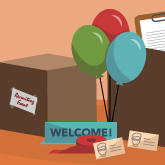 Have you hosted your own hiring event or career fair? What are your best tips for holding a successful event? What Does Labor Market Tightness Mean at the Local Level?